If you’re looking for a heavenly, crowd-pleasing, gluten-free Thanksgiving (or anytime) dessert look no further! Chocolate Angel Pie was naturally gluten-free before anyone called it that. What is it? A crisp meringue crust, filled with a chocolate-truffle-like filling, then topped with pillowy whipped cream (or coconut cream). I adapted this pie to be totally dairy-free by using coconut milk in the filling, and coconut whipped cream for the topping. You could of course, use regular whipped cream for the topping if you prefer. I made this pie for my Dad’s birthday this weekend. My younger brother declared it his all-time favorite dessert. My husband is also a huge chocolate pie fan and said it was at the top, as far as chocolate pies go. The filling reminds me of the inside of a high-quality chocolate truffle. 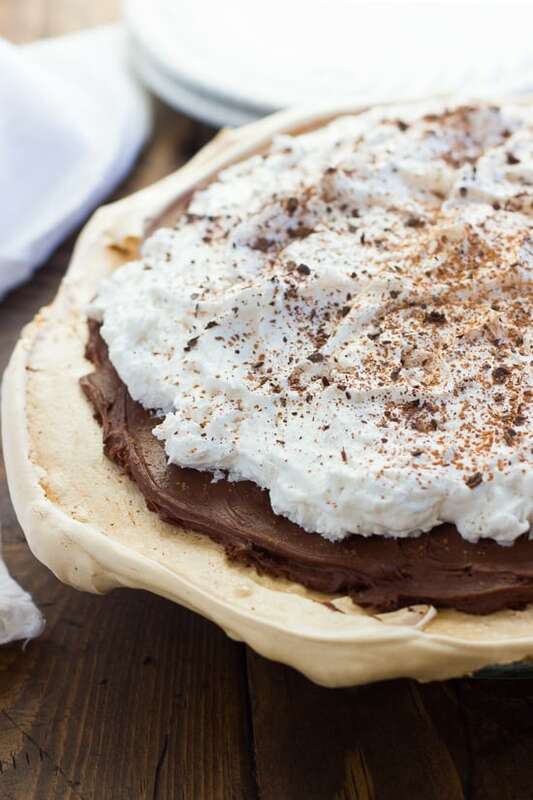 The combination of textures with the light, crispy merinuge, silky chocolate filling, and soft whipped cream is what makes this pie so angel-like. And like these Crustless Pumpkin Pie Cupcakes, you don’t have to master gluten-free pie crust to make this dessert. It’s made from pantry ingredients you probably already have on hand! The filling and crust can be made up to a day in advance. The just assemble the pie an hour (or up to 4 hours) before serving. Enjoy! This recipe requires a can of coconut milk to be refrigerated overnight, so plan accordingly. I actually keep a can of coconut milk in my fridge all the time. 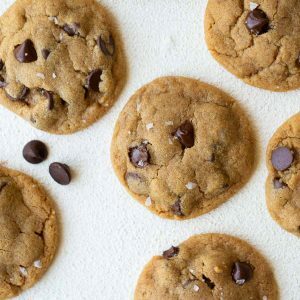 Be sure to use chocolate chips with no dairy to keep this dairy-free. I use the semi-sweet chocolate chips from Costco. 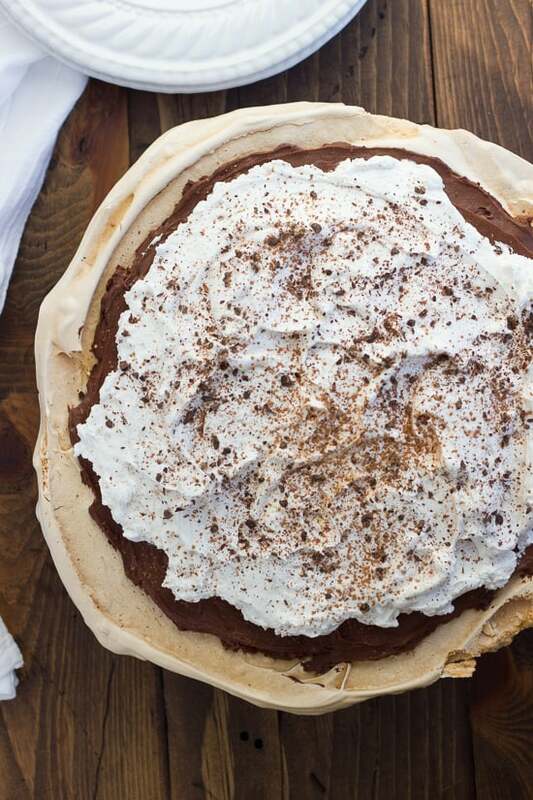 The filling and crust for this pie can be made a day in advance. The you can assemble the pie an hour (or up to 4 hours) before serving! After you have refrigerated the coconut milk overnight, open the can and carefully scoop the solid white part from the top out into a bowl. Pour the remaining liquid from the bottom into a small saucepan. 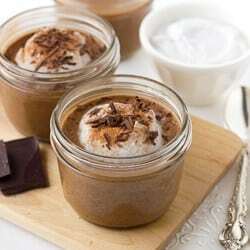 Microwave the chocolate at 50 percent power, stirring occasionally, until melted, 2 to 4 minutes. Meanwhile, whisk the egg yolks, sugar, and salt in a medium bowl. Bring the remaining coconut milk liquid in the saucepan to a simmer. While whisking constantly, slowly add the hot coconut milk liquid to the egg yolk mixture in 2 additions until incorporated. Return the egg yolk mixture to the saucepan and cook for another 30 seconds to 1 minute, stirring constantly until slightly thickened. Stir the egg yolk mixture into the melted chocolate until combined. Let the mixture cool for about 10 minutes. Meanwhile, using a stand or hand mixer, whip the solid coconut cream on high speed until light and fluffy, about 3-5 minutes. Gently whisk 1/3 of the cream into the cooled chocolate mixture. fold in the remaining whipped coconut cream until no white streaks remain. Cover and refrigerate at least 3 hours and up to overnight. Preheat the oven to 275F. Grease a 9-inch pie plate, then generously dust it with cornstarch, using a pastry brush to evenly coat if needed. Combine the sugar and 1 tablespoon cornstarch in a bowl. Using a stand or hand mixer, whip the egg whites and cream of tartar on medium-low speed for 1 minute, until foamy. Increase the speed to medium-high and beat for 1-3 minutes, until the egg whites start to be fluffy and white. Slowly add the sugar mixture, whip for another 3-5 minutes until the mixture forms stiff, glossy peaks. Spread the mixture into the prepared pie pan covering the bottom and sides. Bake on the lower-middle rack for 1 1/2 hours. Rotate the pie plate, reduce the oven temperature to 200 degrees and bake for 1 more hour, until completely dry. (Shell will rise above the rim and may crack slightly). Let the crust cool completely before filling, about 30 minutes. You can make this crust up to 24 hours in advance. Let the chilled filling sit at room temperature for 10-15 minutes. Scoop the chocolate mixture carefully into the crust. Use an off-set spatula or butter knife to carefully spread the mixture evenly. 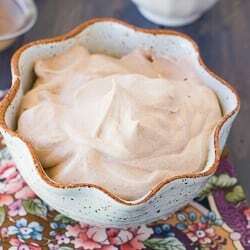 Top with the cocowhip, whipped cream, or coconut whipped cream. Dust with cocoa powder or chocolate shavings. Cover and refrigerate for a least 1 hour. Serve within 4 hours of filling. Enjoy! I must start by saying: THANK YOU! THANK YOU! THANK YOU! I am so glad you shared this! Chocolate Pie was always one of my favorites, but after realizing I could no longer enjoy diary or gluten products, I had given up the idea of being able to enjoy this treat ever again. Having seen this post, I cannot wait to start mixing it up for a special treat! I am definitely looking forward to enjoying this on Saturday, when I will have hopefully recouped from Thanksgiving!